The off-the-shoulder or cold-shoulder trend has been going strong now for several seasons and doesn't seem to be slowing down at all. I have read so many reviews where the writer states that "most women are narrowest at their shoulders" or "the last place a woman shows her age is her shoulders" and "every woman looks good in off-the-shoulder tops". I must be the odd ball woman out there because I have tried so many of these tops on and I haven't liked the way I looked in any of them. Part of my reasoning is body type and another part is modesty. First lets discuss body type. I think off-the-shoulder tops look best on women with small busts and thin arms. I carry most of my weight in my upper body; especially the bust and upper arms, so off-the-shoulder tops just accentuate that weight. Secondly is modesty. Now, don't get me wrong. I do not consider off-the-shoulder tops immodest. I think women who have the body type for them and wear them are appropriately covered and look wonderful. But for me, I feel naked in them. I don't know why. I know it's not much different than a tank or a sundress, but there is something about having both my entire chest and shoulders exposed that's just too much for me. Perhaps I keep envisioning an actress sitting seductively in a bed wearing nothing but a robe slipping off her shoulders. Whatever it is, I personally do not feel comfortable in them which means I would not enjoy wearing such a top. So, how do I participate in the cold shoulder look if I don't want expose so much skin? By wearing a cut-out top instead! On our way home from Myrtle Beach my husband and I stopped in Wheaton, Illinois to meet our kids for lunch and pick up our cat whom they were pet-sitting. We arrived an hour early and there was a Ross store next to the restaurant we were to meet them. We decided to kill some time and shop there for a bit, and I'm glad we did because I found this pretty teal top for only $7.99! I wore my shirt with white jeans, a long pearl necklace, a teal bracelet, my new Steve Madden wedges and I carried my new striped bag. I went shopping with this outfit on and I received so many looks and compliments. So many women loved this top! It made me feel very confident and I was so happy to have found a top that was trendy, yet appropriate for my body type and style. The top is a sheer, lightweight gauze, so a tank top underneath is a must. I think by now everyone knows I love tops made of this type of material for summer. They keep me cool, yet covered. I can't wait to try this top with a pair of shorts! 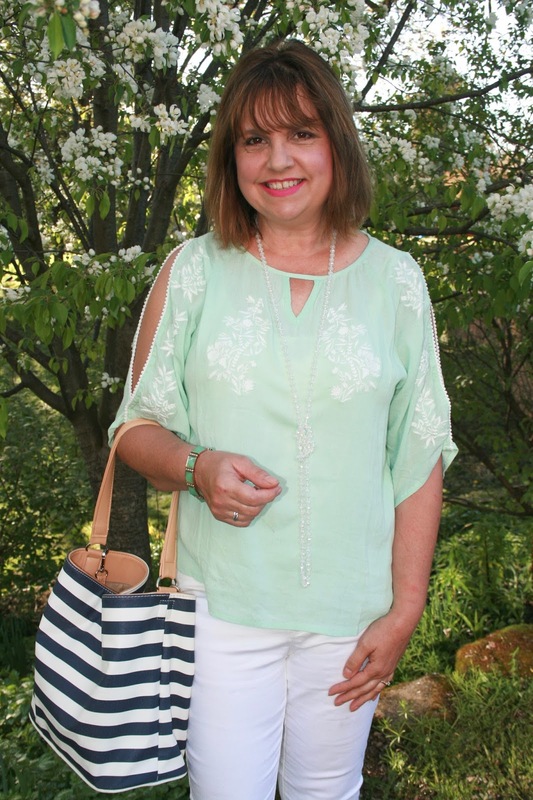 To find such a pretty, trendy top for only $7.99 is such a bargain! I love Ross! 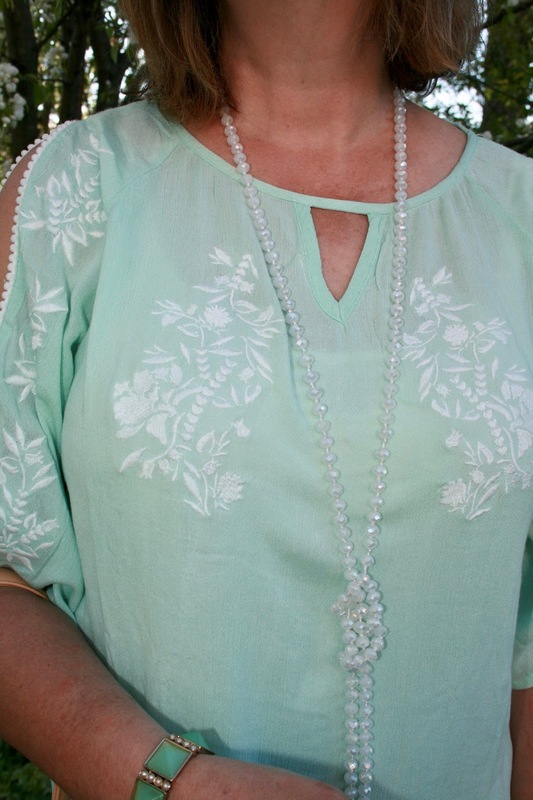 The soft mint or teal color is so pretty and flattering. I also love all the little details in this top: the pom pom trim on the shoulder, the keyhole chest opening, and of course the gorgeous embroidery! This top has it all! My necklace I picked up at a boutique while shopping in Myrtle Beach. They had a BOGO sale so I got two of these necklaces: white and peach. 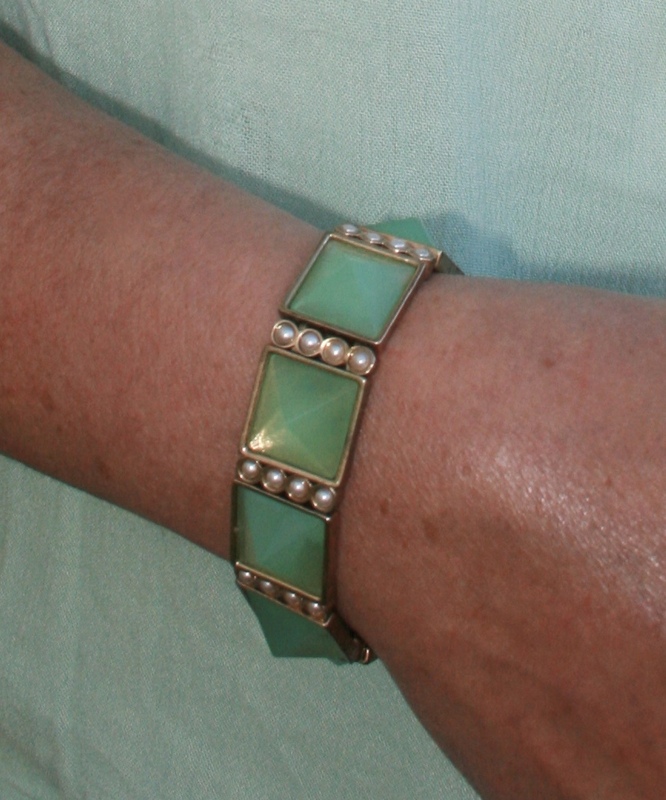 I wore a jade and pearl bracelet on my wrist (old). Fashion trends come and out and each of us has to make the decision to either embrace a trend or skip it; but sometimes we can find a nice alternative to make a fashion trend work for us too! 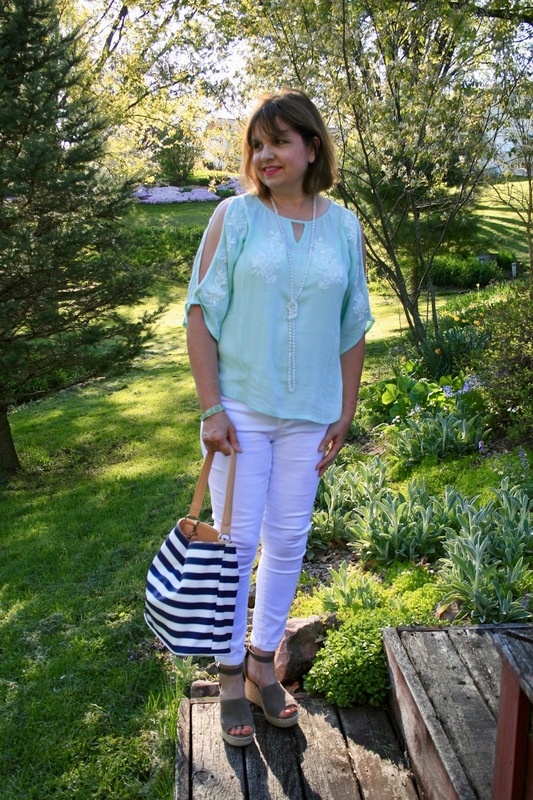 I have worn cut out shirts before when I borrowed THIS TOP from my daughter and I also own a more modest cobalt blue top that has cut outs in the sleeves. In addition, I just ordered a off-the-shoulder top with thick straps and a sleeve around the thickest portion of the arm, so I will let you know what I think of that style soon as well. Even if I don't like it and end up returning it , I'll take a picture of me wearing it. I'm anxious to see if that style will work for me. So what about you? Have you tried the Cold-Shoulder or Off-The-Shoulder Trend yet? What are your thoughts? I'd love to hear from you! 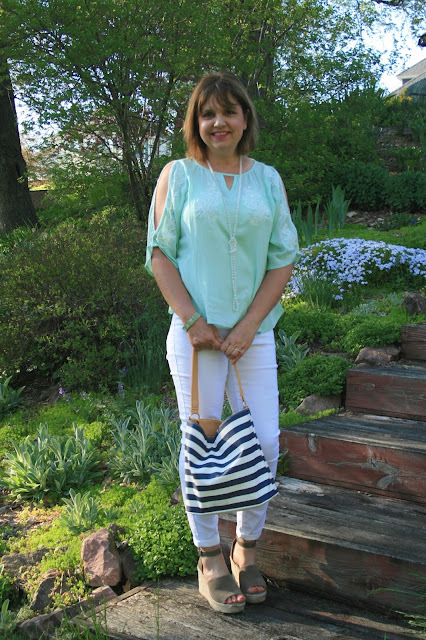 Love the color of the top, perfect for the warmer months! And the cut/style of the shirt looks really cute on you too! While I don't mind cold shoulder tops, I am with you on the off the shoulder look. Something just feels like it's missing and I do not feel comfortable wearing those types of shirts. I imagine if they had straps they would be do-able, but then the elastic of the shirt would probably bother me on the sides of the arms. LOL - I'm hard to please! Thanks Elli! The color is very unique and is what sold me on the top as I don't have much of this color in my wardrobe. I so agree with you about comfort level in the off-the-shoulder look. It would drive me crazy too! So pretty Amy! I absolutely love the color of your top. Styled beautifully! 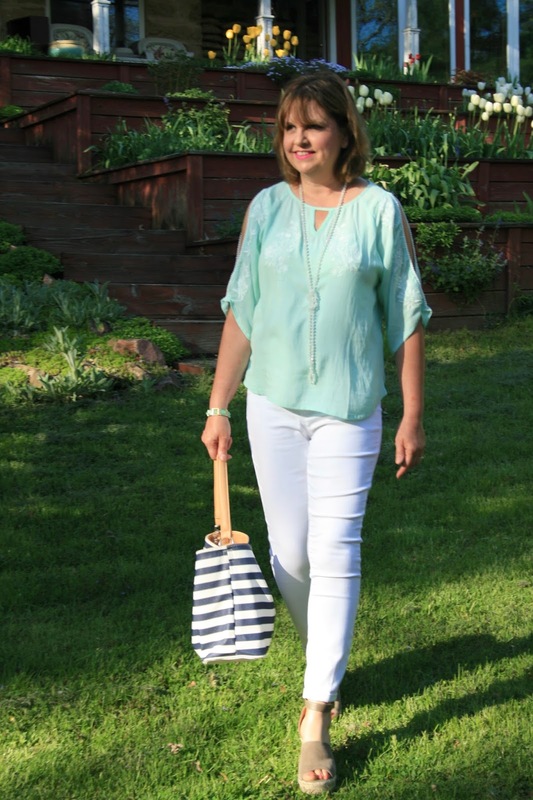 I love this mint top and it suits your colouring and what a bargain. Great summer fresh look. I've bought two split arm tops this year and that's as much as I'm prepared to expose! Thank you! I can't agree more! I'm one of those that loved the idea of these shirts the first time I saw them, Amy!! It was the off the shoulder versions that I've had to test out slowly!! This shirt is absolutely perfect on you! The embroidery makes it super modern. And I love that you love a deal as much as I do!! Thanks Andrea! Hopefully you can find one as inexpensively as I did. Then if the trend is over quickly, you didn't spend much money on it! Thanks Melissa! I love a good bargain! This is how I like to wear my tops too. Just a little shoulder with a cute sleeve detail. Love the color on you too! That is an adorable top, Amy! It's a great alternative to all the off-the-shoulder tops out there right now. Love the color and the embroidery! Really pretty on you! It's funny because I'm talking alternatives to of-the-shoulder tops in my post today. Though I have plenty of them in my closet I have to admit it's not always easy wearing them. I have my favorites that stay put and some I've even started wearing pulled up on my shoulders. No matter the style, comfort is key. Thanks Mary, I'll go and check your post out! I have the same issues with the cold shoulder look on me, although I've seen several people that look great with it. I love your green top - it's a great 'lighter' take on the trend, and that color is amazing! Thanks Lynda! It's good to know I'm not alone! I've read so many posts that say they look good on everybody, it makes me wonder "Why Not Me Too?" Such a beautiful top, Amy!!! You pull off the trend so elegantly and you've styled it perfectly! I cannot stop buying off-shoulder or cold-shoulder or cut-out sleeve tops (like yours) lately. I find them flattering and fine on my body but not all of them fit me right. Never seen a Ross in Michigan but I have heard great things. Your aqua top is so cute and hits so many current trends. 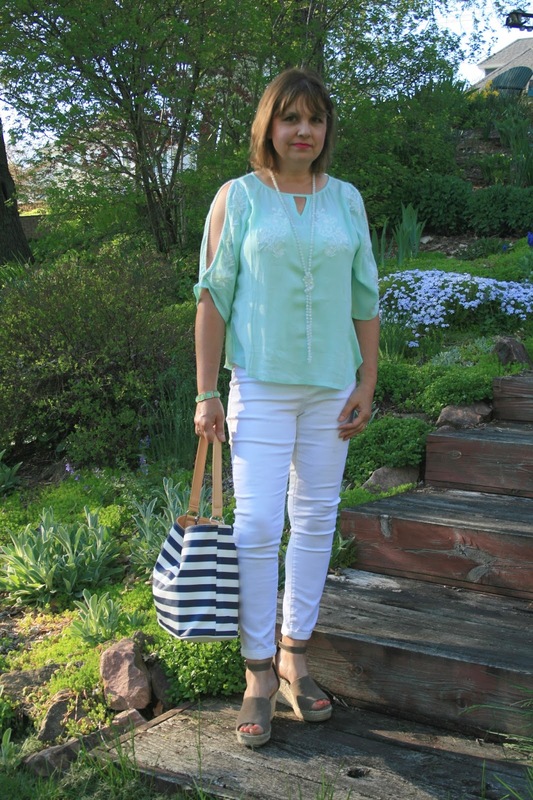 You styled it in the most perfect way with white jeans and a striped tote. Thanks Ada! I bought one more of these tops, but now I think I'm done. They are so trendy, I don't want a year from now to be tossing them into the donate pile when they go out of style. A very practical approach and nod to the trend if you are not sure of the shoulder. I've got one cold shoulder dress which I haven't worn yet so I guess I'm like you. I was very uncertain when they first appeared. Still they're not disappearing are they? I guess we have to find a way to adapt. Thanks Anna, no, I don't think cold shoulder tops are going anywhere soon. This is my way to be a part of the trend. You look cute in this outfit! Thanks for linking up to Top of the World Style. That top is such a great find and the perfect way to wear this trend! 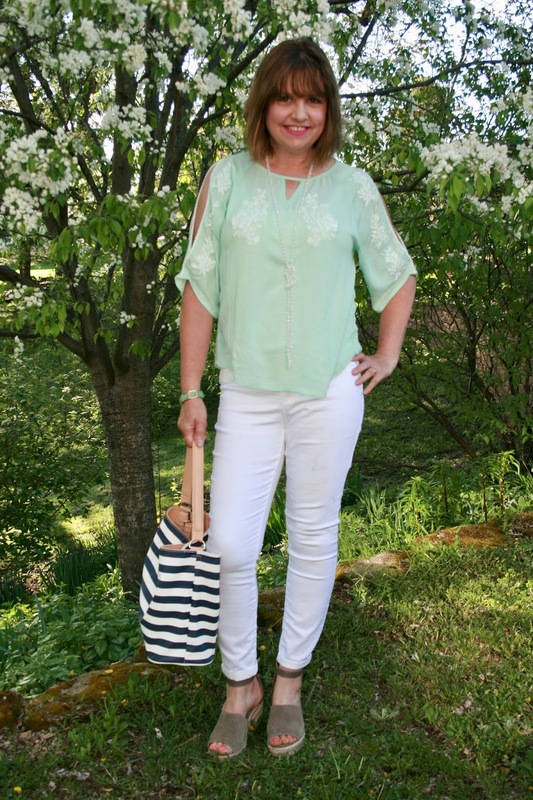 So pretty styled with the white jeans and I love the embroidery detail! Great points Amy! 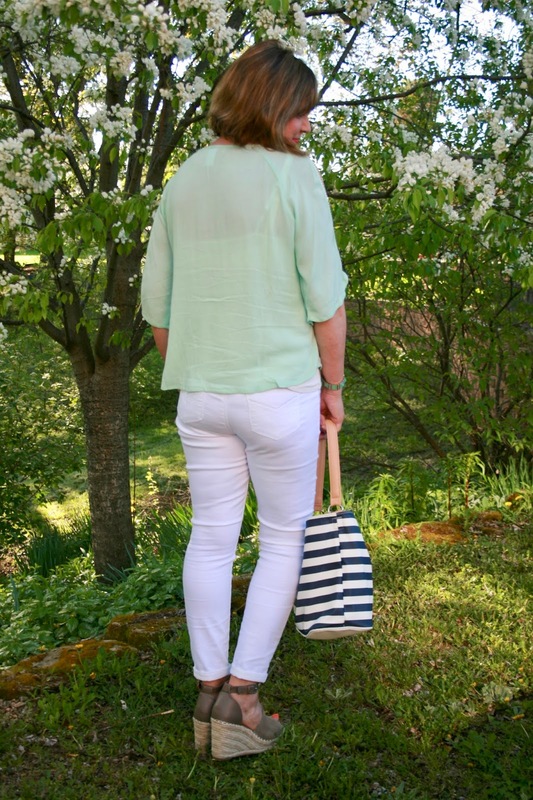 Not everyone feels their best in OTS tops, and I love the aqua blue with your white jeans. The top gives just enough exposure, lovely!